It was a little spider that infused new hope into the Scottish king Robert the Bruce - remember the story? Little Miss Muffet was frightened of one of them, so much that she abandoned her snack and ran away. Aragog, the chief of the Acromantula colony that dwelled in the Forbidden Forest in the Harry Potter series, was also an eight-legged arachnid. Worldwide, there are various myths and beliefs woven around these stupendous creatures. So what are we crawling towards? A bunch of books about spiders of course! I chanced upon Wolfie at a book sale. It is a Science I Can Read book authored by Janet Chenery and illustrated by Marc Simont, and I picked it up without giving it much thought - it had a decent font size, the language seemed good and the pictures looked neat. Little did I know it would lead to many discussions about spiders! Two little boys capture a spider and make it their ‘pet’. They catch insects to keep their pet nourished and watch over it with great delight. There is a little sister and a wholly relate-able sibling squabble thrown in. Interspersed into this simple storyline are their discussions with their teacher, and they learn that their pet is called a wolf spider. The reader learns all about the species - there are 30000 types of spiders and some of them, like Wolfie, do not spin webs, they just chase their prey and hunt them down. The book above led us to another wonderful tale spun around spiders, published by Tulika. Titled The Spider’s Web, it tells us of 6-year old Ali and his photographer dad who observe a delicate yet sturdy web glinting in the sunlight. Amazing photographs interspersed with illustrations by Ashok Rajagopalan (need I say more?!) flow along with the narrative. As a wise friend once told me, it is simple things that are complicated to convey. Lata Mani has done a great job of it indeed. 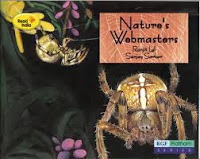 Last of all is this book I have been meaning to review forever - Ranjit Lal’s Nature’s Webmasters, published by Pratham Books. Packed to the brim with information about spiders, the book features superb illustrations by Sanjay Sarkar. The tone is not boring or zoology textbook-like, it is playful and witty. Did you know that an acre of the countryside could hold up to two million spiders?! 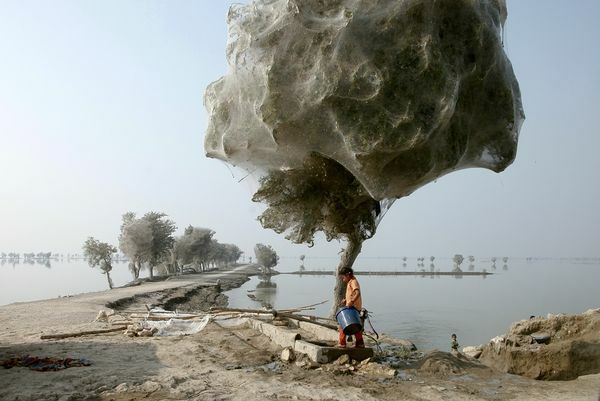 Well I had just read about that, but here is a startling demonstration of the fact - last year the Sindh province in Pakistan had got flooded, leading to a migration of all spiders from the ground level to high up on the trees. Result: cotton candy trees! ETA: And of course yet another book with a spider-hero is Charlotte's Web! Thanks Niveditha (of Tulika Books) for reminding me! Just today, I was looking at Tulika's Spider Web! Wolfie is definitely going on the list. Not to mention the giant spider Shelob on the border of Mordor in the 'The Return of the King' of 'Lord of the Rings'- the one that Frodo and Sam have to get the better of before they could get to Mount Doom and destroy the One Ring. utbt: Can be borrowed from us -s what if we live in different cities?! S: Aah. Why am I not surprised you came up with another example?! Very nice Chox! Coincidentally, we have been caught up with Anansi (the trickster spider in W.African, Native American and some other cultures too) ourselves! It started with Gerald McDermott's Caldecott Ashanti Tale (Anansi, the spider) and we have couple more Anansi ones, that our lib has, lined up! And Charlotte was a big hit! 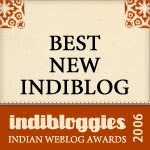 So excited to see the crawlers clustered here, they so deserve it :) Curious to check out Tulika's and Ranjit Lal's. And oh, the kids' jaws dropped on reading and seeing the cotton candy trees - thanks! Those cotton-candy trees are amazing! Have to show it to everybody! Meera: Thanks! And yes, there you go - Anansi! If she liked Charlotte's Web, the other two by E.B.White are worth checking out too - Stuart Little, which is IMO would be third (but still very good) among the three he wrote for kids, and Trumpet of the Swans which is totally awesome. Ashok: Thanks for stopping by and commenting. It is not easy to captivate young children and so hats off to your delightful creations, and one more thing - you are very modest!